Freelancers Anonymous will be released November 16 and as I have already seen a screener of it, I can tell you why you need to pre-order the movie now. I love the fact that the movie revolves around female freelancers like me and that some characters are simply brilliant. At ClexaCon London, I have briefly talked to Natasha Negovanlis about the movie. She plays Gayle and is happy to share with you why she thinks you will enjoy this movie. Read my blog post or watch the video below the image. Being a freelancer myself, I love seeing that part of my life in a movie. Freelancers Anonymous shows how hard it can be to start something. It does not show how hard it can be to keep your company (about 70% of companies founded stop after only four years!) but you definitely gain insight into all the work it takes. The movie also shows how it really takes a community to make it happen for you. Everybody adds a piece. Finally, it shows how you need to convince everybody that you have a solid product or service every single day. Freelancers Anonymous is written by two women (Lisa Cordileone and Amy Dellagiarino), directed by a woman (Sonia Sebastián), produced mainly by women, and all the main characters are played by women. That is rather fresh in today’s entertainment industry. In fact, Freelancers Anonymous made it to ReFrame’s list as a gender-balanced production. ReFrame is a coalition of industry leaders founded by Women in Film and the Sundance Institute that launched a data initiative in an effort to recognize and promote gender-balanced films and television shows. It collaborates with IMDBPro and relies on IMDBPro’s data to analyze films and television series to see how many women were involved in the production and how much screen time female characters had. To earn the ReFrame Stamp, a film or TV show must meet some requirements that call for women in key roles like starring, directing, producing, and writing. Additional points are given for having racial diversity. I admire this movie for having such a female energy! For me, the highlight of this movie was seeing Gayle’s second freelance job that she needs in order to support her first freelance job. I do not want to give away what it is but I can only imagine how hard Natasha Negovanlis had to laugh when she first read the lines that she would eventually have to say out loud. 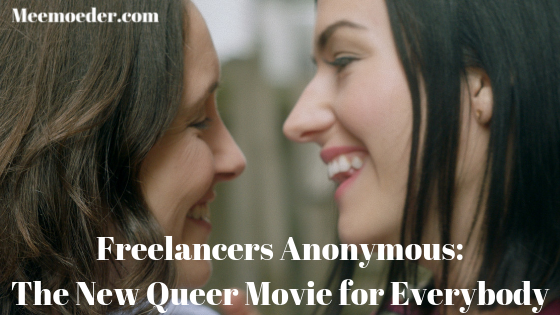 Freelancers Anonymous has queer characters but does not make a big deal out of it. Billie and Gayle are shown in the final few months before their wedding and that is all you need to know about that relationship. Yes, obviously, their wedding plays a big part in the story but not how it has historically been done. It focuses on how they prepare for it rather than on the queer part of it. Because no deal is being made of it and the movie shows the things we all encounter in our wedding planning phase and in our struggles at the office, it is a movie for everybody. Do I need to highlight one of the few male characters in the movie? Yes. Who is Larry? What does Larry do? What does Larry add? Those are all legitimate questions. I do not have the answers for you. That is precisely why I need to mention him. I love random stuff like that in a movie! What are you going to do this weekend? My guess is watching Freelancers Anonymous! On the Freelancers Anonymous website, you can pre-order the movie now or order the movie starting from November 16. Would you please share this post with every queer person you know? Representation matters and the more we know what movies are out there for us, the better! Lesbian web series tip! Different for Girls is a rather new UK lesbian web series. It has crazy talented actors, like Rachel Shelley and Victoria Broom. I cannot wait for another season! Indiegogo campaign tip! Short film The Date is now looking for funding. It is the story of two women looking for love in the dating world of the 21st century and aims to offer positive lesbian representation in the media. With what I have seen of it so far, I can say that it looks promising! PS here are my interviews with Natasha, Elise & Annie, Kat Barrell, Jamie Clayton, the team behind I Can’t Think Straight, Nicole Pacent, Mandahla Rose, the writer and producer of Different for Girls, and the directors of ClexaCon.